Using of this equipment in full autonomy is not planned, so it requests outer (230V) power supply. Its collapsible water tank (3000L) can serve as a water source or it can be supplyed from pipe system. 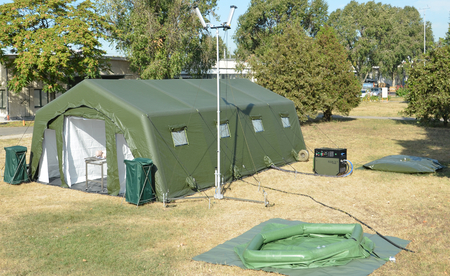 Without setting up the strecher holding frame it can be used as a normal personel decontamination tent (4 lines, with 3 showers in each).